Warehouse Partners provides a variety of different line marking preparation methods and paint systems, and can create any bespoke requirement for pedestrian walkways, pallet lanes, and hatched areas, maximising durability as well as cost-effectiveness. At Warehouse Partners, we believe we are the only company in the UK to offer a complete line marking solution in-house, from conceptual design & planning through to installation that optimise customer operations and meets today’s strict facility safety requirements. Design aspects are covered in consultation with the customer and then drawn so that working models can be discussed and approved prior to installation. Assistance with key issues will be discussed during site visits. 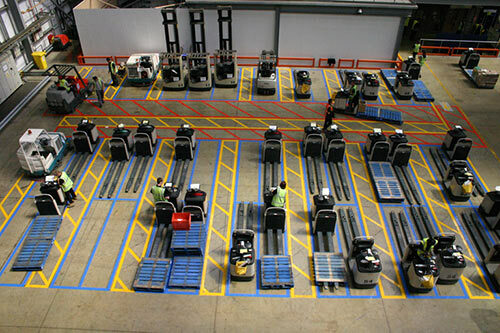 Warehouse Partners’ line marking can be cleaned using conventional methods dependent on option chosen. Learn more with our simple guide to line marking. Read more about the different floor preparations that Warehouse Partners provide. Would you like to find out more about the line marking services Warehouse Partners provide, download a data sheet below.